Listen here Star Trek is a vehicle for science fiction themes, and like many science fiction stories, it sometimes uses the future to focus on issues that touch us today. I look at the issue of sentience, as seen in respect of the character, The Doctor on the series Star Trek: Voyager. After a brief look at the way this pop-cultural icon addresses the issue, I launch into other considerations of sentience, highlighting moral inconsistencies and moral compartmentalisation and the way this relates to non-human animals. Yesterday was International Women’s Day. It was a good occasion to consider women in positions of power and the power structures they work within. It was a good time to consider the plight of women globally. So let’s briefly look at women high in the hierarchies of power. Women who seek power do so for many reasons. Those women who attain the upper echelons of power in our world today often do so by fitting into patriarchal society’s ideas of power. These structures — due to the cultural construction of masculinity — inevitably engage in activities detrimental to humans, non-humans, and the planet. Women who only seek personal power may do so by becoming as oppressive as any part of the patriarchal system. There are extreme examples of this on both sides of politics. Less extreme examples are those who enter politics in the hopes of making positive change but who end up supporting oppressive measures e.g. drone strikes which kill women and children. This is particularly the case if the oppressive measures they support are not directly related to the situation they are trying to change. Those who seek power as a means of being effective in creating change often find their efforts hampered by the very structures they have adopted to achieve power. The structures themselves often use, or are, a means that runs against beneficent change. To the extent her efforts look likely to succeed, attempts to create change can undermine a woman’s position of power within the hierarchy. The question then becomes one of means and ends, and of types of power. One does not have to fit into the dominant paradigm to have influence. Much of the power of dominant systems is what Starhawk called “power-over”. Much of community-based power is what she called “power-with”. Power-with can be far more powerful than power-over, but it requires the ability to work with others, and is generally facilitated by non-violence. And this is where you and I come in and what should not matter to us. We might feel we are inadequate. I feel inadequate when I set out to write a blog. I may use too many commas, or, not enough or my sentences might run long. And I may start sentences with “but” and “and”. I have a tendency to meander, lose focus and repeat myself. Sometimes my efforts have made me a target and that’s OK if it was the result of my speaking out for a good cause. Was it Mr. Squiggle who said, “We may wear pants that are too big for us, or we may be too big for our pants.” No that was me. 😉 Sometimes I get so frustrated I wish I had magical powers 😉 but although I feel quite inadequate when I write, or when I make images or vids, or in my efforts to do vegan education, I do it anyway. If I may be serious for a moment about things we think are permanent obstacles. We may think we have no ability to influence. We may not have power in government and we may not be part of the 1%. We may not have the educational background to be considered “qualified”. We might not fit into the stereotypes of the female gender and we are marginalised. Sexism and misogyny, racism, heterosexism, and speciesism may be pervasive and at times invisibly hold us back. Society’s heterosexism may make us feel we are invisible because we are not be able to marry our partner and it may make us fearful of violence. Some nights we may lay in bed pondering our ability to meet our own expectations to do the smallest of tasks. We might have a disability or body image issues which has plagued us our whole lives. Our parents may have told us over and over that we are no good, or that we are too good, or that we will never amount to anything. We might have such great expectations put upon us that we feel we have failed even before we have begun. We may not have internet access because our village is too far from a city. We may wonder where our next meal is coming from. We may be viewed as property in our own country and exploited unjustly. If we are vegan, most of our friends and family may think that being vegan and promoting veganism – the abolition of animal exploitation – is wasting our life and they may think we are crazy. Invitations to events may become fewer and further apart, until they stop altogether. “I was going to die, sooner or later, whether or not I had even spoken myself. My silences had not protected me. Your silences will not protect you…. What are the words you do not yet have? What are the tyrannies you swallow day by day and attempt to make your own, until you will sicken and die of them, still in silence? We have been socialised to respect fear more than our own need for language. We need to remember that nothing is permanent and that includes our time on this planet so we need to make our thoughts and actions count. Our thoughts and actions are all we possess. Although we may feel our voice is too tiny, or that the structures of power are so big and overwhelming that there is no point in speaking out, when we start to believe our own negative programming (as women tend to do) the structures of power have won. They would like us to feel powerless and disconnected. They will pit us against each other as the media tends to do to women. When we believe we are powerless, when we become apathetic, we curl up and start to die. There are so many kinds of obstacles. Some are huge and real and others that seem real only exist in our minds. The truth is that no one can control us while our mind is free. Even if we are quadriplegic and only able to breathe through a ventilator, we can have good thoughts for a nonviolent world. Each nonviolent thought has its effect. Because our mind is free we can do what we can to make change – a change to a nonviolent world with different values than those cherished and defended by a patriarchal culture. And even if we know we will lose the fight, we must keep on fighting, always in the name of nonviolence. We must never give up because those who cannot speak – non-human animals and anyone who is vulnerable– rely on us. And we must never forget that the most amazing social justice movements are always started by a small group of people. And here’s the final point I have been moving toward or meandering to, depending on my attention span. If we believe in justice for all, then this is what we need to consider. Yesterday, on International Women’s Day, did we remember the 99.99% of the planet’s population who are non-human? Did we remember all the non-human mothers in the world? Did we consider in particular the non-human mothers we use as resources? If we did not, then we need to include them in our thoughts and our actions and consider that ALL mothers and their children, no matter what species, should be free of exploitation. Because if non-human mothers are not free, none of us are free. In fact there are parallels with how patriarchal society views and treats women, and how we use, exploit and control the reproduction of non-human females. The two are not unrelated. Women are no longer considered legal property as non-human animals are, but violence against women is at epidemic proportions today and violence against nonhumans is greater still. So here’s the truth, a truth rare and powerful which we all need to recognise. ALL sentient beings deserve at least one right- the RIGHT not to be used as property, the RIGHT to exist for their own purpose, free of our interference and violence. Non-human animals love life and do not want to die. They have their likes and their dislikes; they have different abilities to us; they love their young; they have their own purpose. Whether they are of a different species is irrelevant. It is not necessary for them to be “like us” or have a similar “intelligence” to us for us to avail them the respect they deserve. Respect means we need to stop using them for food, clothing, entertainment or other reasons. As we move forward, including more and more persons in the sphere of “rights”, we must include non-human animals. They are persons too. We can become part of the grassroots, nonviolent social justice movement – Veganism – by becoming vegan and incorporating justice and nonviolence in our own lives. Had Martin Luther King Jr. lived long enough, I believe he would have become vegan. Let us remember the almost countless number of non-human animals throughout time who have endured our constant oppression and exploitation, who have been tortured and murdered, mostly for our palate pleasure. Let us end our participation in the most bloody and violent, most horrendous slavery ever witnessed in the life of this planet. Our penchant for violence and exploiting the vulnerable is at the root of most of our problems. Here is what we need to take into our hearts – we will never know peace while we exploit the vulnerable – non-human animals. 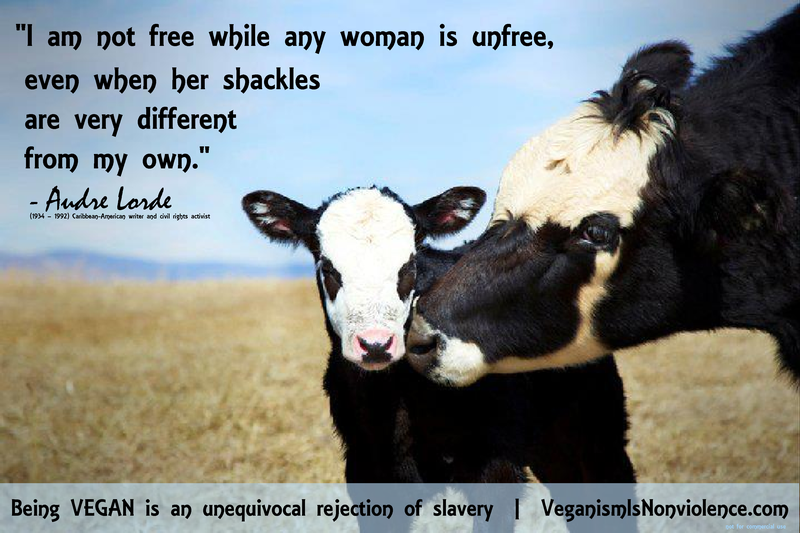 Let us end our participation in the violence of patriarchal paradigm by becoming vegan. Friends, Please think about who you are promoting in regards their positions on violence. For example, there are a few advocates who promote a person Gary Yourofsky stating that a speech he made about being vegan a couple of years ago is “the best speech you will ever hear”. But I would like you to also consider that he also promotes violence against women. The following quote comes from the same person who is advocating that we cease violence against nonhuman animals. You cannot isolate a speech about being vegan from misanthropy and misogyny and pretend those pro-violence positions do not exist. We should be appalled and rightly so and reject discrimination of all kinds because they have no place in a movement about nonviolence. Misanthropy and misogyny have no place in a movement about nonviolence. Violence is the problem, not the solution. Please be congruent in what and who you promote. There are no leaders in a political nonviolent grassroots vegan movement. We are all be leaders. Please be nonviolent and please promote veganism in nonviolent ways. San Francisco Police Department ‘It Gets Better’ Video: LGBT Officers Release Inspiring Message (VIDEO).